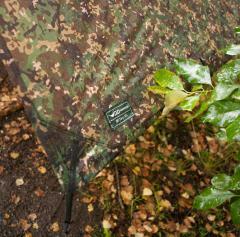 A bloody fantastic tarp, a bit like the British army Basha, but a tad better! Large enough for all kinds of setups, with a LOT of attachment loops. Works well on its own or over a hammock. Comes with a stuffsack, ropes and even pegs! DD Multicam is DD Hammocks own take on Multicam, basically a sort of Flecktarnish (the German army camo) pattern with Multicam style sandy colours. It is quite a lot darker than original Multicam making it blend in far better in lush forests. 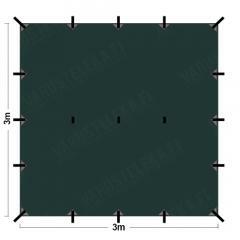 Measures 3 x 3 meters. 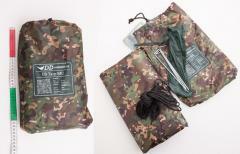 Includes four pegs, four guy lines and carry pouches. Weight 950 grams for the whole package. A huge amount of loops for pitching just about any form of shelter, get some ideas here. Made of lightweight but strong 190T polyester, completely waterproof. 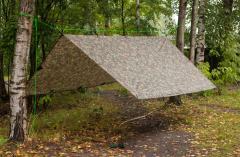 Means waterproofness doesn't suffer if your shelter isn't fully taut for any reason. Works extremely well with hammocks. Pitch it over one and enjoy the rain not pouring on you. Always take a tarp with you when hammock camping. The pictured poison green ridge line is not included, but very effortless to make, you just need some Paracord and two Mini Carabiners! 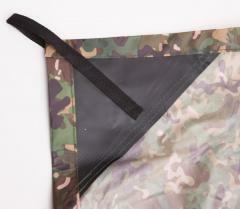 Pro-tip:You could always use bungee cords for setting up the tarp - an old British army trick! They're very fast and easy to use, but in really rough weather might be too flexible.